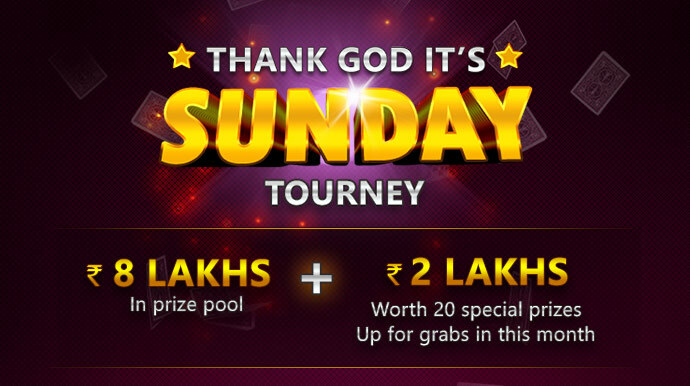 Sundays won’t be that boring now if you are a rummy game enthusiast! Ace2Three, the premium online rummy website from India has announced new rummy tournaments that will be held on every Sunday . The top players from these tourneys will share the prize pool of Rs.8 lakhs along with some cool smartphones from Lenovo and power banks from Samsung. The tournament doesn’t need any entry fee to register. All the premium players at Ace2Three can register for the rummy tournaments at 10:00 AM on the tourney days. The TGIS rummy tournaments from Ace2Three will run on all Sundays at 3:00 PM. A maximum of 10000 players can join these tournaments and compete for a prize pool of Rs.2 lakhs and other exciting prizes per tourney. The registration for these rummy tournaments starts at 10:00 AM on the tourney days and all the cash rummy players at Ace2Three are eligible to join it for free. A total of 500 winners will be sharing the prize pool of Rs.2 lakhs per tourney and the top 5 players from each tournament will win exciting prizes from Lenovo and Samsung worth Rs.50,000. To make your registration for the rummy tournaments, login to your Ace2Three account and click on ‘Tournaments’ tab. Select the ‘Freeroll’ tab and register for the tournament on the tourney day by clicking on the ‘Register’ button. To know more about the website and their exclusive promotions, bonus offers and deals, read our article on Ace2Three here. If you have already participated in these rummy tournaments and have a feedback for the same, post it in the comment section below.